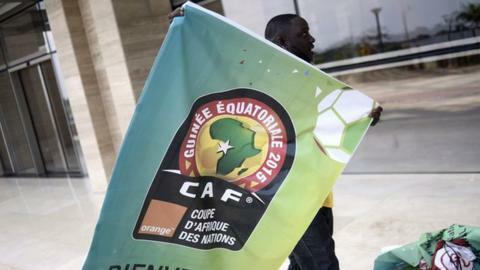 Sixteen teams go into the 2015 Africa Cup of Nations tournament in Equatorial Guinea hoping that after a total of 32 games have been played over 18 match days they will emerge as the winners. First they have to qualify from one of four groups, each containing four teams, with only the winners and runners-up progressing to the next round. BBC Sport looks at the draw and provides some key facts for each team at the competition, which kicks off on Saturday and runs until 8 February. All the key facts for the four teams competing in Group A at the 2015 Africa Cup of Nations. Equatorial Guinea were given a place at the finals after replacing Morocco - they had been eliminated from qualifying after being penalised for fielding an ineligible player. They are the only side ranked outside Fifa's top 70 and appointed coach Becker only 11 days before the start of the tournament. Burkina Faso surprised everyone by reaching the final last time out in South Africa. They finished as runners-up after losing 1-0 to Nigeria. Prior to that the Stallions had never won a Nations Cup match on foreign soil (a run of 21 games without a win). Winger Pitroipa was crowned the best player of the 2013 Nations Cup - and he scored six goals in qualifying for the 2015 edition. Gabon were one of four teams to qualify unbeaten (along with South Africa, Cameroon and Tunisia). They have won only won one match away from home at a Nations Cup finals - when beating Zaire (now DR Congo) in 1996. Gabon co-hosted the finals in 2012 along with Equatorial Guinea. Congo are appearing at their first Nations Cup since 2000. Coach Claude LeRoy won the Nations Cup with Cameroon way back in 1988 and will be at his eight finals - a record. The Red Devils knocked out 2013 African champions Nigeria in qualifying. All the key facts for the four teams competing in Group B at the 2015 Africa Cup of Nations. Zambia won the 2012 tournament when Equatorial Guinea co-hosted with Gabon. One year later, the defending champions exited the competition without winning a game. Ten of the current Chipolopolo squad were part of the victorious 2012 side. DR Congo have not reached the Nations Cup quarter-finals since 2006. Ibenge combines his DR Congo coaching duties with local side AS Vita, this year's African Champions League runners-up. DR Congo's Pierre Ndaye Mulamba holds the scoring record for a single Nations Cup - 9 goals in 1974. Tunisia are at their 12th consecutive Nations Cup - the best record of any team on the continent. Their sole title came on home soil in 2004, beating North African rivals Morocco in the final. They have reached the quarter-finals at four of the last six tournaments, but exited in the group stages in 2013. Cape Verde is the smallest country to ever compete at a Nations Cup. Yet the 'Blue Sharks' reached the quarter-finals when making their Nations Cup finals debut in 2013. All of their current squad play their club football outside of Cape Verde. All the key facts for the four teams competing in Group C at the 2015 Africa Cup of Nations. Ghana have reached last four Nations Cup semi-finals. The Black Stars raced to four titles but have since been eclipsed by Egypt (seven) and have not lifted the trophy for 33 years. Former Chelsea coach Grant only took charge last month. Algeria crashed out in the group phase last time around but have since climbed to the top of the African rankings and reached the World Cup knock-out stage for first time in 2014. Attacking midfielder Yacine Brahimi is reigning BBC African Footballer of Year. Won the Nations Cup on their debut appearance in 1996. Current team is hoping to win the title to honour late captain and goalkeeper Senzo Meyiwa, who was shot dead in November. Bafana Bafana have won just one of their last 12 matches at the Nations Cup. Senegal's recent record at the finals is not good - they have won only one of their last nine matches. Their last victory came in 2006, against Guinea in the quarter-finals. However, they conceded just one goal in qualification for this tournament. All the key facts for the four teams competing in Group D at the 2015 Africa Cup of Nations. Lost in the 2006 and 2012 finals. Defeat three years ago came against Zambia, who were then coached by Renard. The Elephants are without legendary striker Didier Drogba, who has retired from internationals, but they still scored the most goals in qualifying - 13 - and boast Bony, who has just become one of Africa's most expensive players after joining Manchester City for £28m. Mali have an excellent record once they have qualified for the finals - in their eight appearances they have reached the semi-finals on six occasions. They finished third at the last two tournaments. The Eagles pulled off an incredible fightback against Angola in the opening match in 2010, coming back from 4-0 down with 11 minutes to go to draw 4-4. Cameroon failed to qualify for the 2012 and 2013 Nations Cups and suffered a disastrous 2014 World Cup. But the Indomitable Lions shrugged off those disappointments as well as the retirement of Nations Cup all-time record goalscorer Samuel Eto'o to qualify unbeaten. Strikers Aboubakar and Clinton N'Jie scored seven of Cameroon's nine qualifying goals. Guinea achieved qualification despite the ongoing Ebola crisis in the country that prevented them from hosted matches at home, instead they played their ties in Morocco. Coach Dussuyer is taking charge of Guinea at a Nations Cup for the third time, having first led them at the tournament in Tunisia 11 years ago.